A Thai journalist and prominent critic of the country's military rulers has resigned from his newspaper, a day after being released from jail. Pravit Rojanaphruk tweeted that he was resigning from the Nation newspaper to save it "from further pressure". He was detained on Sunday and forced to attend an "attitude adjustment" session for violating rules on information. Meanwhile the junta has said elections were unlikely before 2017. It had initially promised a vote this year. However that timetable has slipped repeatedly as the leadership struggled to redesign a political system that would weaken the role of parties and elected governments, says the BBC's Jonathan Head in Bangkok. 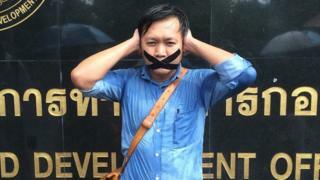 Pravit was arrested hours after tweeting: "Freedom can't be maintained if we're not willing to defend it." He had been detained once before, shortly after the coup. Upon his release on Tuesday, he tweeted: "My ideology is intact." But on Wednesday he said that he had taken the decision to resign from the English language newspaper after talks with management. In an interview with the BBC, he said his belief in democracy remained unchanged. The media had a responsibility to ensure that Thais do not think of military rule as a "normal situation", he added. Since the May 2014 coup, numerous politicians, journalists and citizens have been required to attend "attitude adjustment" sessions. These sessions are essentially brief periods of incarceration by the military and can last up to a week. Last week, the military detained two former MPs who had been critical of the junta, including a former energy minister. In addition to the adjustment sessions the military have also increased prosecutions under the country's lese majeste legislation, which prohibits any criticism of the monarchy.